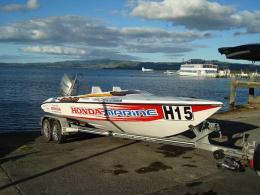 Atrocious sea conditions caused carnage for the fleet of the Formula Honda Powerboat Series in the Whitianga Offshore powerboat race yesterday in New Zealand. Representing the UK from the Honda Formula 4-Stroke Powerboat Series were 2007 Champions Lings of the 150 hp class. The guest team from England, David Cowley and Paul Barkshire took the helm of Honda Marine, renamed Lings Honda and surprised many with their aggressive driving in the rough water and for a time lead the class. However after a very close race, they had to be content with second, with Mike Smith and Matt Hopkins in Cougar Marine winning their third race of the season. Coming third was the winner of the last race, Mark and Bryce Helms in Miss Electropar. Cougar Marine the official sponsors of the Formula Honda series in New Zealand also have a huge connection with the UK's one design series the Honda Formula 4-Stroke. Both Formula 4-Stroke 150hp and 225hp classes are designed and manufactured by Cougar Marine in the UK which is owned by Steve Curtis eight times world Class One Powerboat Champion and Honda F4SA Director. Lings will soon return home to the UK to prepare for their first race of the 2008 Honda Formula 4-Stroke season to be held in Torquay. The team take on a bigger boat this year as they progress into the 225hp class with Mis Toft II Lings.